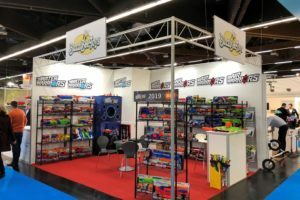 If you keep track of Buzz Bee Toys’ social media, you’ll have seen this post today featuring their booth at a toy fair in Germany. 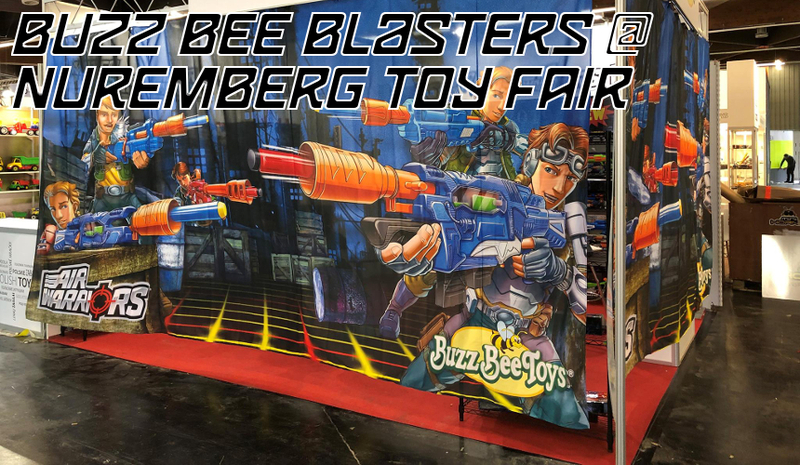 In it, we have lots of their current blasters on display, but also some new ones – which hopefully we’ll be able to see and play with at New York Toy fair! See also some analysis by other blaster fans in this Reddit thread. Picture of the full booth. 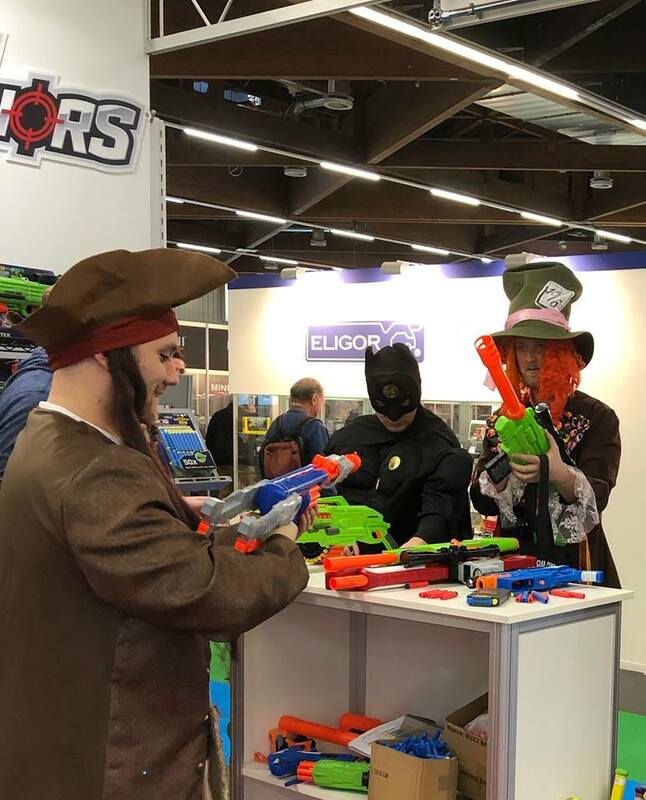 Booth Attendees trying out the blasters. There are several blasters at the front of the booth, some of which have been trademarked for a while but are now just being seen. Revolution – This appears to be the next evolution of the Champion/Reaper/Eradicator/Night Attack progression. Clip fed, top prime. Two boxes are shown, with a short magazine as well as a long one. 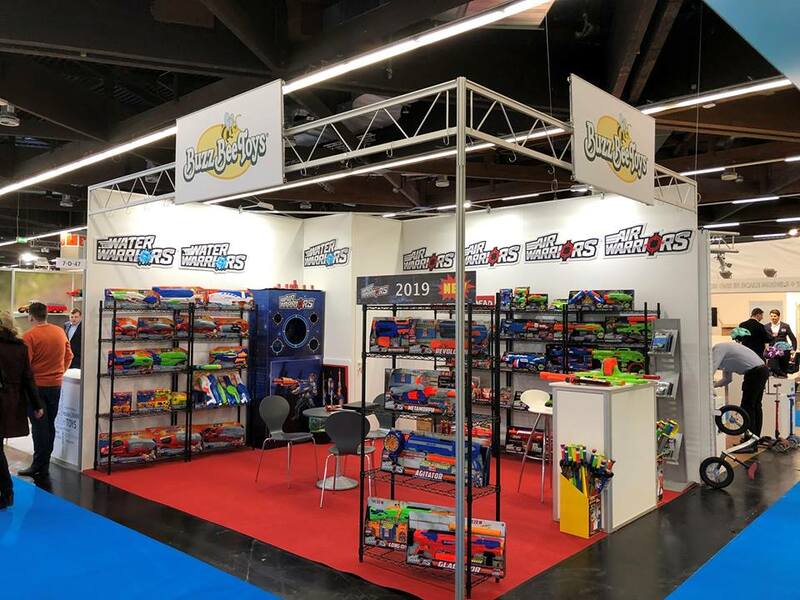 This is just a part of Toy Fairs, with different options being shown for retailers to see what they might like on shelves. Metamorph – This is a cylinder-fed blaster with what appears to be a folding, removable stock (or at least some sort of blaster reconfiguration). Agitator – This blaster makes me happy. It would appear to include an actual drum magazine (package says “Rapid-Fire Drum Clip), and seeing there’s no front loading anywhere on the drum or a hole in the shell for insertion a la the Barbarian, I’d say it’s a real drum clip. Plus, it’s pump action and appears to have a retracting stock. Gladiator – Vertical pump grip, and what looks like a retracting stock and detachable barrel. Long Distance? – We can’t see the whole box, but it would seem to be a newer version of their “sniper” bolt action blasters, and is magazine-fed. There are few new items here, although I will note one blaster on the third shelf down, on the far right, is a new design (have seen it in the Hong Kong Intellectual Property Office’s Journal). I would bet that is the Saturator, based on the names currently trademarked, but that’s not 100% certain. In addition, there are reappearances of some previous blasters, including the Splat Blaster (a lever-action soaker). I’ll be at New York Toy Fair next weekend, and will have updates at Buzz Bee Toys’ special showing when it happens! 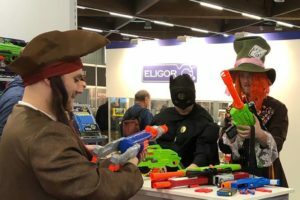 This entry was posted in Dart Blasters, News/Updates and tagged 2019, Air Warriors, blaster, blaster hub, buzz bee, news, toy fair on February 8, 2019 by BuffdaddyNerf. Nerf Titan, Perses, Revoltinator, Megalodon Info Officially Released! Signing Off Until Toy Fair!